(2:35 p.m. EST) -- Disney Cruise Line's four current cruise ships are known for their dedication to family entertainment onboard, as well as their Art Deco and Art Nouveau style influences. According to a news release from Disney Cruise Line today, the cruise line's three newest and yet-unnamed ships -- scheduled to launch in 2021, 2022 and 2023 -- will follow a similar design aesthetic. 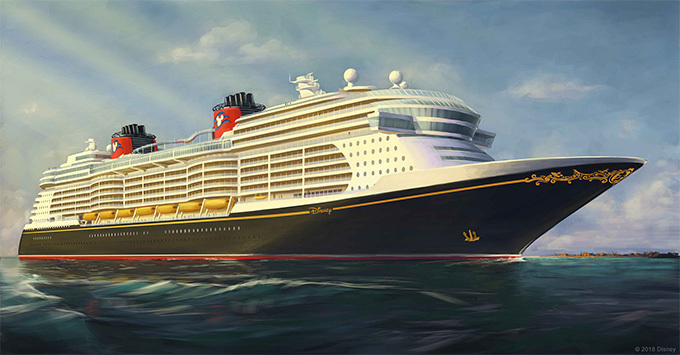 An early rendering shows a white ship with Disney's signature red-and-black funnels depicting an outline of Mickey Mouse, and a dark hull with golden-yellow stenciling. According to the release, "In keeping with the distinct Disney Cruise Line style, the new ships will embody the elegance and romance of the golden age of ocean cruising with unique touches all their own. The new vessels will offer more innovation, new technologies, spectacular entertainment and more Disney stories and characters than ever before." Each new Disney cruise ship will weigh approximately 140,000 gross tons and include 1,250 staterooms, and will become the largest ships in the Disney Cruise Line fleet.